Elliebelly Knit & Dye Works > Blog > Knitting > The countdown is ….. ON! The countdown is ….. ON! I’m almost into Ravelry. I’m so excited! In case you haven’t heard about it, Ravelry is only the coolest site ever for knitters with communities, features, patterns, stash counters and more and more. My friends who are there already rave about it. If you haven’t signed up yet, you need to! And great news, there will only be 13,900 people ahead of you in line waiting to get in. You are #7130 on the list. 180 people are ahead of you in line. 13899 people are behind you in line. I have good information that they’re letting in 150 people a day! I had originally thought I would get in on Sunday, but now it looks more like Monday. I can’t wait to get into the promised land Ravelry. I’m so excited about using the tools I hear it has for keeping track of needles and for matching patterns to stash yarn. To keep myself from bubbling over, I started Lizard Ridge (see previous post). This is my first block, after finishing the first repeat. 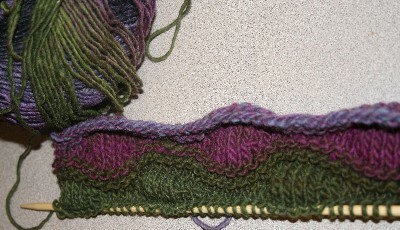 advice and decided to knit garter ridges instead of stockinette for more texture and to make finishing easier. I really like it, although I may try a panel in stockinette next and decide which I prefer before going on. rows per 10cm (4inch) square on US 11needles. 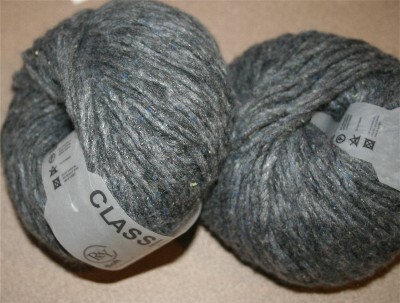 I’m planning on making a simple hat for boychild #2 to take off to school in Connecticut. If he doesn’t behave, it’s going to stay here and be mine (I have to say that, because he reads my blog). It’s very subtle and pretty. I’ll pull out Ann Budd’s basics book and start this one up for some easy meeting knitting for the next few weeks. Does anyone else go in cycles? I seem to stack up several projects so they are almost finished, then put them aside, case on a few new ones, knit a bit, and then go back and finish up the others in a huge flourish of knitting. I’ve never done it intentionally, but I notice that I’ve done this several times. Is it a character flaw? Now I’ve got to go and look at spider eggs with Miss Ellie. She is graciously helping me stay occupied until Ravelry breaks down and lets me in. Joyce, I’m sorry you haven’t got in yet. I got my invitation this week and am just now getting it setup. I got in about a week and half ago. Expect to get NOTHING done for the first couple days. no knitting, laundry, dishes etc. I spent the first day just seeing everything. Then I started to build my queue. (not finished with that yet) I still haven’t decided wether to enter my stash yet (I have a spreadsheet already with greater detail). I did decide to enter my wips. I found my notebook to add details. Then I decided it wasn’t right not to have photos. I had find a place to take good photos, set up a flicker account, upload the photos. I am still delighted with it although some new sock yarn and a yarn shop that opened 3 blocks from me now has claimed some of my attention. I had no idea I could check! I’m #9020 so at 150 per day it looks like I’ve got about two more weeks! Yay! Thanks for the link – now I’m giddy! lol! The lizard ridge block is beautiful. Great colors! Tell Miss Ellie when I read spider eggs, I went yuck! Now if they were lizard eggs, it would be a different story. I love Lizard Ridge too, especially in the colors in the original photograph. Can’t wait to see yours as it progresses. You lucky thing i am #21252 on the list. I have 13729 people ahead of me nnnooooooooooo….. Does this mean when you get in, you will disappear into knitting heaven and we will never hear from you again? Your black kitty looks a little like mine.